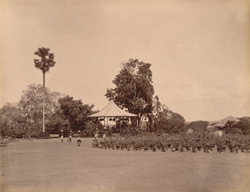 Photograph taken about 1900 by the Government photographer, Zacharias D'Cruz of the Band-Stand in the Public Gardens in Trivandrum. It is one of 76 prints in an album entitled 'Album of South Indian Views' of the Curzon Collection. George Nathaniel Curzon was Under Secretary of State at the Foreign Office between 1895-98 and Viceroy of India between 1898-1905. The idea of establishing a Public Garden in Trivandrum was sanctioned by the Maharaja in 1859 and was to be accomplished under the direction of John Allan Broun, the Government Astronomer.Several interesting botanical specimens were reared in the garden from seeds and cuttings procured from Bangalore and other cities. In 1879, the Curatorship was abolished and the management of the museum and the gardens was placed under a Committee consisting of the British Resident and three European members. In 1897-98, the institutions were placed under an officer called "Director of the Government Museum and Public Gardens". The Band-Stand shown here was re-built in the early 1900s.